Supervising Minister of Education, Nyesom Wike has given his former ally and Rivers State Governor, Rotimi Amaechi condition for peace. Wike, who has been at loggerheads with his state governor over the control of party structures in the state and Amaechi’s perceived opposition to President Goodluck Jonathan’s second term ambition, was speaking at a Grassroot Development Initiative, GDI event that took place at Omoku, Ogba-Egbema/Ndoni Local Government Council in Rivers State on Sunday. The minister said if Amaechi wants to take back control of the Peoples Democratic Party, PDP, structure in Rivers State, he should first relinquish the Supreme court mandate that was given to him in 2007 to former Governor of the state, Sir Celestine Omehia. The Minister noted that without doing so, Governor Amaechi should just accept defeat. 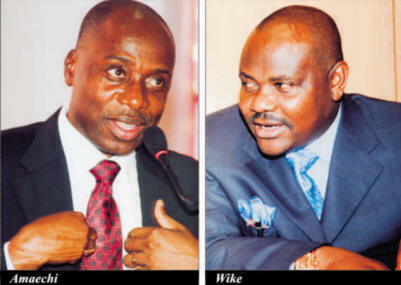 Wike, who is the grand patron of GDI said, “No amount of going to another state to give condition can change anything. What people don’t understand is that they will push some people to the wall and the people will react. “We are good people; we are willing to make peace. We are willing to surrender the party structure if you will also surrender that mandate the court gave you in 2007. Give it back to the man who owns the mandate. The time has come; there is nothing you can do again. “Let me tell you something, anybody who says Jonathan will not come back, let him go to the state which he belongs to. Rivers State has made a decision that come 2015 we will back our son, President Goodluck Ebele Jonathan”.